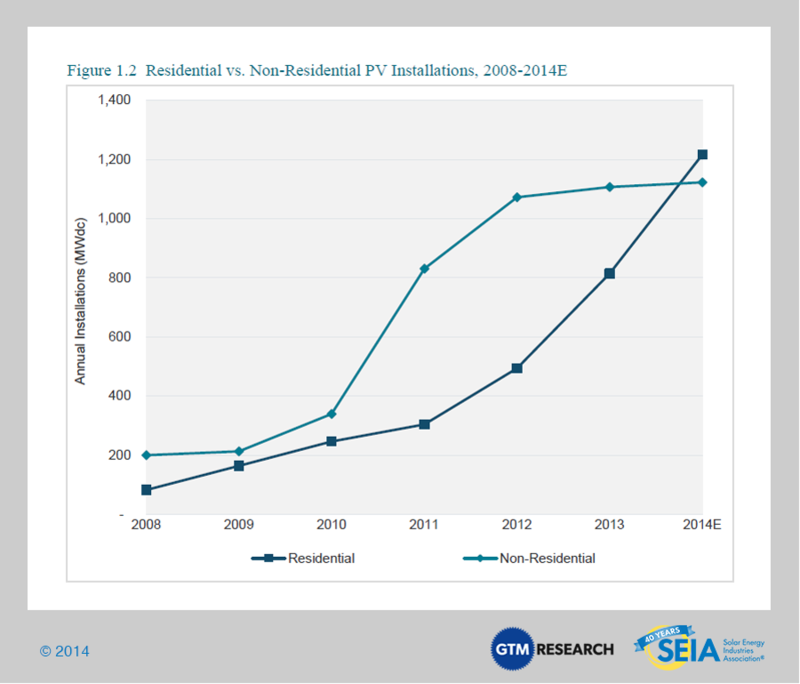 The report forecasts the U.S. to install 6.5 GW of PV in 2014, a 36 percent increase over the historic 2013. 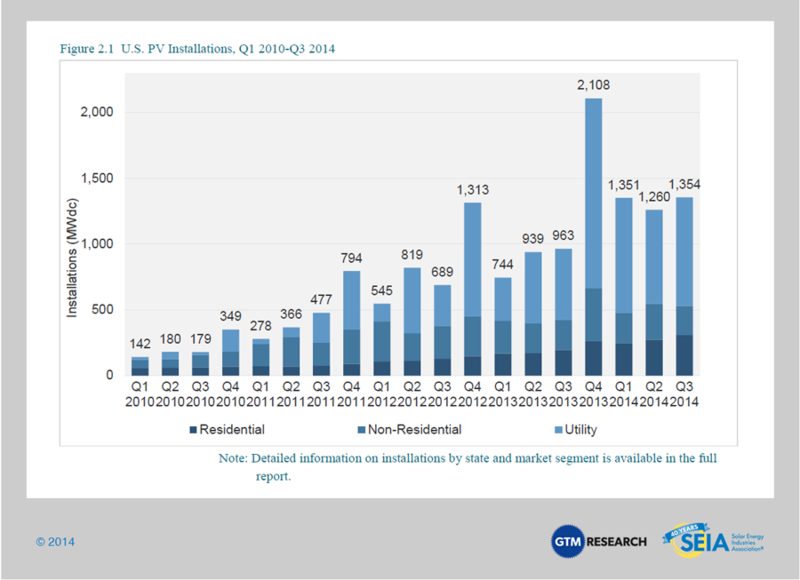 Continuing its strong growth, the United States installed 1,354 megawatts (MW)1 of solar photovoltaics (PV) in Q3 2014, up 41 percent over the same period last year. The numbers come from the latest edition of GTM Research and the Solar Energy Industries Association's (SEIA) U.S. Solar Market Insight Report, released today. According to the report, Q3 was the nation's second largest quarter ever for PV installations and brings the country's cumulative solar PV capacity to 16.1 gigawatts (GW), with another 1.4 GW of concentrating solar power (CSP) capacity. Solar is proving to be an important and growing source of new generating capacity for the United States. Through the first three quarters of the year, solar represents 36 percent of new capacity to come on-line, up from 29 percent in 2013 and 9.6 percent in 2012. The report tracks installations across three market segments: utility-scale, residential and non-residential which includes commercial, government and non-profit installations. Historically, the U.S. utility-scale market segment has accounted for the majority of PV installations, and this past quarter continued the trend. The U.S. installed 825 MW of utility-scale projects, up from 540 MW in Q3 2013. This marks the sixth straight quarter in which utility-scale PV has accounted for more than 50 percent of the national total. The U.S. residential market exceeded 300 MW in a quarter for the first time in history. Impressively, more than half of this total came online without any state incentive. Residential continues to be the most reliable market segment, now growing 18 out of the past 19 quarters. GTM Research forecasts it to exceed the non-residential segment in annual installations for the first time in more than a decade. The non-residential market continues its struggles of late, due in part to incentive depletion in California and Arizona. Installations in the segment were down 3 percent over Q3 2013. However, GTM Research and SEIA do expect year-over-year growth for the non-residential market. The U.S. installed 1,354 MW of solar PV in Q3 2014, up 41 percent over Q3 2013, making it the second-largest quarter for solar installations in the history of the market. Cumulative operating PV capacity has now eclipsed the 16 GW mark, thanks to four consecutive quarters of more than 1 GW installed. For the first time ever, more than 300 MW of residential PV came on-line in a single quarter and more than 50 percent of residential PV came online without any state incentive. 36 percent of all new electric generating capacity in the U.S. through the first three quarters of 2014 came from solar. Growth remains driven primarily by the utility solar PV market, which installed 825 MW in Q3 2014, up from 540 MW in Q3 2013. The report forecasts that PV installations will reach 6.5 GW in 2014, up 36 percent over 2013 and more than three times the market size of just three years ago. Q1 2014 was the largest quarter ever for concentrating solar power (CSP), due to the completion of the 392 MW Ivanpah project and Genesis Solar project’s second 125 MWacphase. While no CSP plants came on-line in Q3 2014, Abengoa’s Mojave Solar (250 MW) achieved commercial operation in December 2014, making 2014 the biggest year ever for CSP.